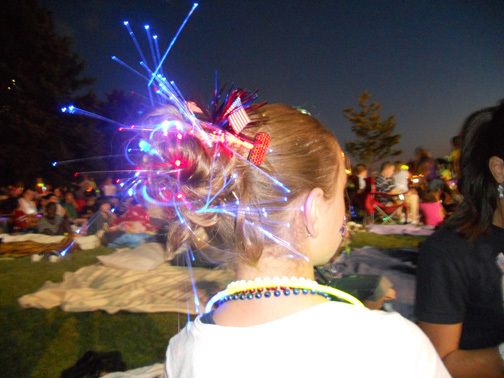 I loved the fiber-optic concept and that you do not have to have a stack of AA batteries stuck in your hair for the lights to work. They do not get hot, and the strands can pretty much work with any style (without breaking). I decided to buy some Glowby’s and try them out. While we were at a fireworks display, our girls were constantly stopped and asked where we found the glow strands. We noticed plenty of people pointing to our girls, and some even wanted to take photos of the styles on their phones. Trust us, your girls will be noticed with this style!!! Items Needed: Brush, rat-tail comb, spray bottle, 1-2 large hair elastics, 1 Glowby. 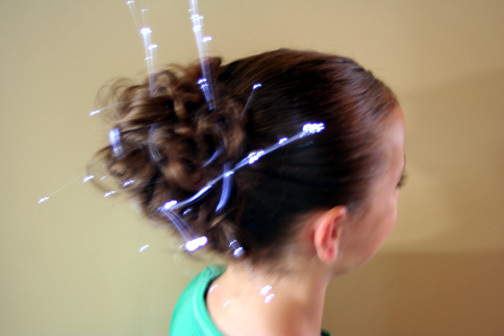 Now, it may look like a bear to take the Glowby out of the Messy Bun, but it really is a 2 second process. Since the strands of the Glowby are smooth plastic fiberoptics, they literally slide right out with a gentle tug on the barrette! No pain! Hope you enjoy this style, which can be used by girls of all ages on any holiday, or by older girls and women at concerts, dance clubs, etc! Enjoy!